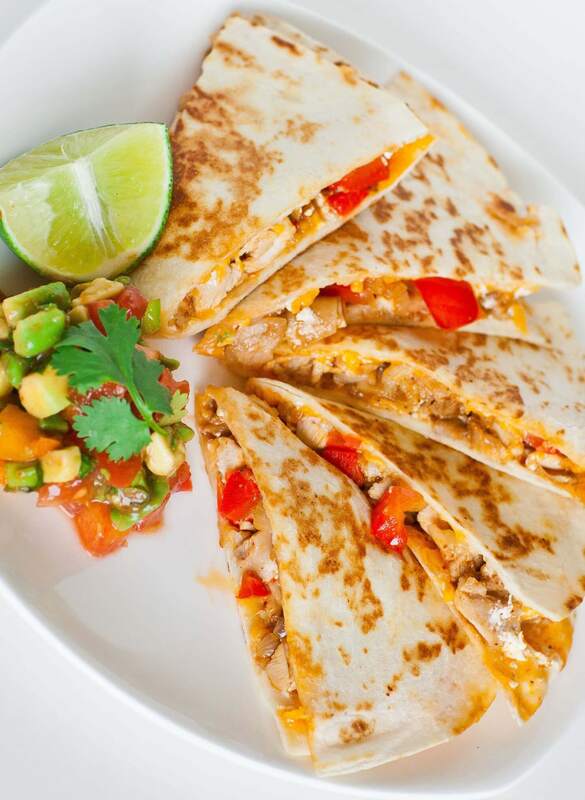 A chicken quesadilla recipe that will knock your socks off! These cheesy and flavorful chicken quesadillas are so easy to make at home and are sure to be a hit with everyone. This no-fail, delicious recipe is made with loads of sweet red bell peppers, juicy and flavorful seasoned chicken and cheddar cheese! I also like to add a bit of sour cream to the quesadilla filling to make every bite extra creamy. And to serve this epic quesadilla, an equally epic home-made avocado salsa. I love a good, sweet salsa and this one is no exception. I make it with loads of creamy avocado, sweet peaches, refreshing cilantro and zesty lime juice. I load up my quesadillas with tons of this salsa, a bit more sour cream and touch of hot sauce to finish things off. This is a great recipe even for a busy weeknight meal. It comes together in no time so you’ll have a home-made meal on the table quickly. Once you’ve tried this recipe, it’s bound to become a staple dish! For step-by-step instructions, watch my video recipe! Prepare the salsa. Place all the ingredients: avocado, tomato, peach, onion, and cilantro; into a small bowl. Season with salt and squeeze lime juice over the mix. Add the taco sauce; gently combine all the ingredients and set into the refrigerator until serving. Prepare the meat. Place whole pieces of chicken into a large bowl. Season with spices, salt and pepper; add a few tablespoons of olive oil to help the spices adhere to the meat. Preheat a large frying pan over medium heat and fry the meat until done, about 7-8 minutes per side. For thicker pieces of meat, cover the pan with a lid. Remove from pan and place onto paper towels to get rid of excess juices and oils. Into the same pan, add the bell pepper and sliced onions; cook until soft and tender. Let the chicken cool slightly before dicing into smaller pieces. To make the quesadillas. Spread a small amount of sour cream all over each tortilla, followed by shredded cheddar cheese (or use your favorite kind). Add the pepper and onion mixture onto one half of each quesadilla, followed by the diced chicken. Fold the quesadillas over in half. Preheat a grill pan or a large frying pan over medium heat. Add the prepared quesadillas and heat each side for 2 to 3 minutes, or until the cheese is melted and tortilla is browned. Remove and cool slightly before cutting into smaller, serving size pieces. Serve with a side of salsa. This looks amazing can’t wait to try it. Just a question did u use fresh peach or canned? I used fresh peaches for the recipe, but either one will work! I just made this recipe. It’s soo good. Everyone liked it in my family. They said it’s like a restaurant style. Thank you for the great and easy recipe! I’m so glad you enjoyed my recipe! 🙂 Thank you for the feedback! We just made this tonight. (Vegetarian version) and it is so delicious! Thank you! Faithful subscriber from now on! This was so delicious! Best quesadillas I ever made, thank you! Awesome! :)) I’m so happy that you enjoyed them!